Singer Building, c. 1908, Library of Congress. 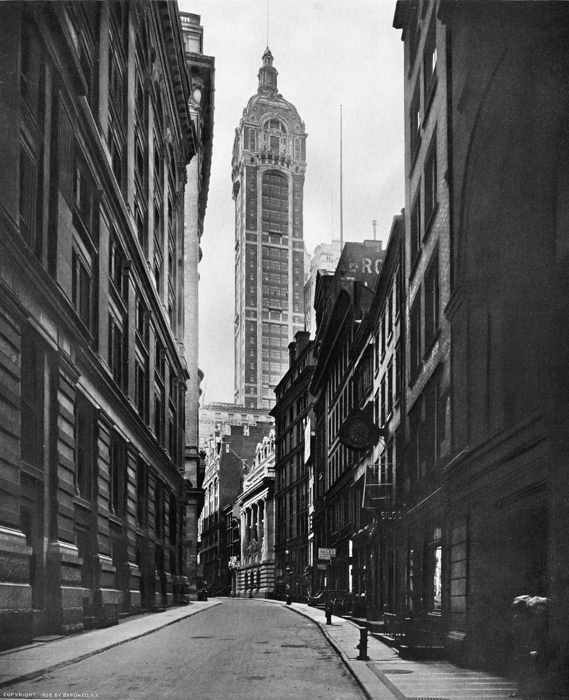 Rising to 612 feet, the 47-story Singer Tower was the tallest building in the world when completed in 1908. Designed as a corporate headquarters for successful Singer Manufacturing Company, architect Ernest Flagg's tower represented the boldest expression to date of New York's ambitious vertical construction. When the company undertook the project in 1906, it was undergoing the final phase of a prolonged period of vigorous expansion in the world market for sewing machines. Flagg, who had also designed the earlier two buildings on the property, combined the existing structures to create a 14-story uniform base upon which a 35-floor tower would rise. Flagg's slender tower of red brick and bluestone in the "modern French" style amazed architectural critics, including Montgomery Schuyler, who judged the Singer Tower "among the most interesting of our experiments in skyscraping." Previously known as an outspoken critic of tall buildings, the Beaux-Arts trained Flagg defended his design as a model for skyscraper reform. The future city, as he envisioned it, would be composed of buildings with thin campanile-like towers limited to one-quarter of a site's area. The lower office blocks would combine to create an ordered urban ensemble, but the isolated towers—memorable, unique, and artfully disposed-would present a freer arrangement of a "picturesque, interesting, and beautiful" skyline with a European flavor. Artists and writers were attracted to the silhouette of the tower on the skyline. Joseph Pennell featured it in his 1908 etching "Unbelievable City," and Alfred Stieglitz made the pair of Singer and City Investing buildings the centerpiece of his famous 1910 photogravure "City of Ambition." The editors of Architectural Record hailed the tower as the "breaking through of another stratum of ether," and for Harrison Rhodes, writing in Harper's Monthly Magazine, it embodied "the romance of the future." In 1968, the Singer Tower became the tallest building ever demolished as both Singer and its neighboring City Investing Company Building made way for the U.S. Steel Building, now known as 1 Liberty Plaza. This account draws on the essay of Gail Fenske in Cass Gilbert, Life and Work: Architect of the Public Domain, W. W. Norton: 2001.